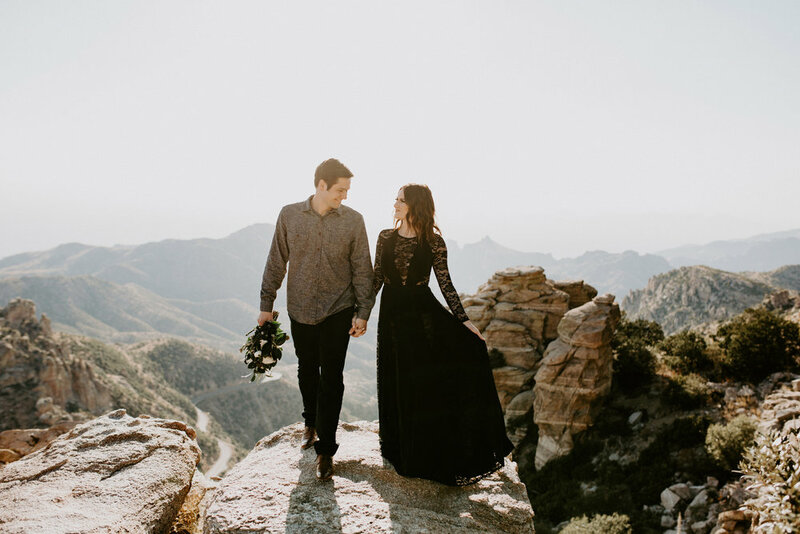 These two wanted some new photos at Mount Lemmon in Tucson to celebrate their 4 year anniversary! Anniversaries are huge milestones so I’m all about it when couples want to document them with a pretty photo session. Count me in! I met Kayla and Jon at the bottom of the mountain. They were dressed to the nines and Kayla even brought a gorgeous bouquet from Flora by Haleigh. 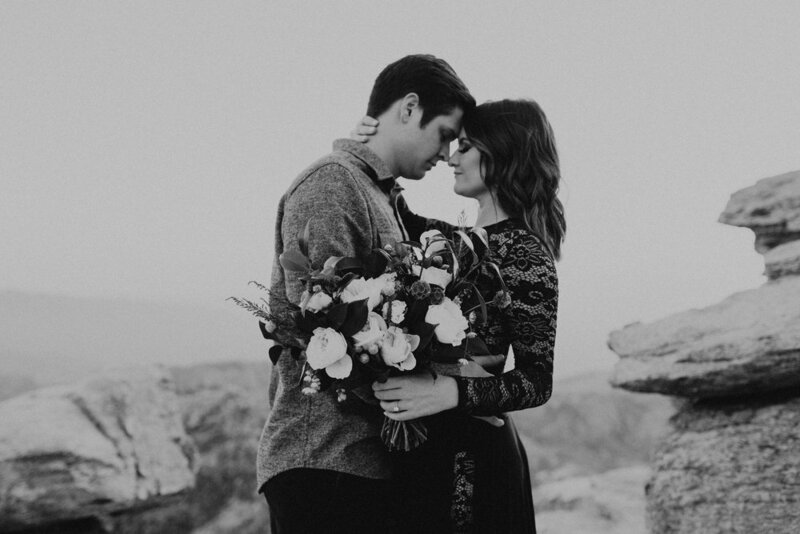 You don’t have to be getting married to incorporate a bouquet into your photos! 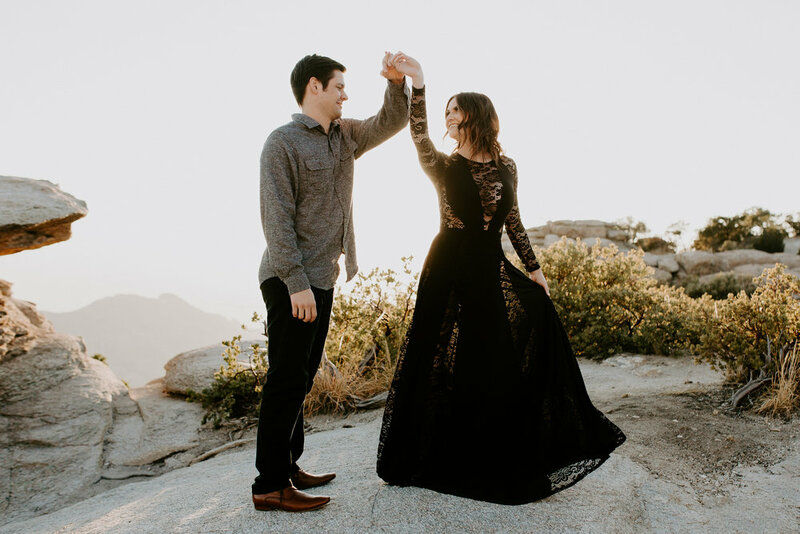 They are such a fun accessory and really add a romantic feel to any kind of couple’s shoot. Kayla and Jon hopped in my car and we made our way up the windy road to the top. We spent the afternoon/evening together, stopping at every cool spot we saw as we made our way up to the top of the mountain for sunset. It was fun checking out some new spots here. 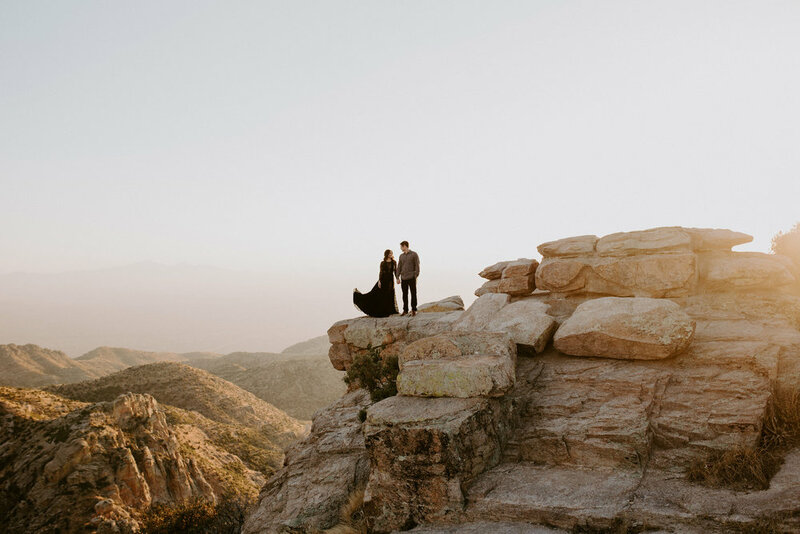 I shoot at Mount Lemmon a lot but it feels like every time I visit I find new unique spots. If you’re an Arizona dweller and haven’t been here before, you should definitely take the time to go check it out. We ended up at Windy Vista Point for the last stop. This spot has incredible rocks and cliffs that overlook the whole valley. You have to be a little daring if you’re afraid of heights but it’s definitely worth being brave for. Sunset at this place was pure magic! The whole sky turned to fire and it was probably one of the coolest sunsets I’ve seen in a while. After we finished up with the last of the photos we took some time to just sit and enjoy the view. There’s nothing better than watching the sunset with your lover by your side. 2018 Erika Greene. Design by Squaremuse.